TINLEY PARK, Ill.--(BUSINESS WIRE)--Panduit Corp., a leading global provider of wire management solutions for wire harness builders, launched today the patent-pending Quick-Build™ Harness Board System. The Quick-Build™ System is a revolutionary modular, expandable solution comprised of 1’ X 1’ (305mm x 305mm) reusable grid tiles with specially shaped holes that accept repositionable accessories to improve the productivity of wire harness build time by up to 18% compared to plywood board and nail method. The specially designed Quick-Build™ mounting pegs lock into the grid tiles with just a twist. Used along with the Quick-Build™ mounting platforms and nail holders, which accept Panduit conventional wire harness layout accessories and industry-standard testing fixtures, these components create a modular harness board system. The Quick-Build™ System elevates harness routing above the grid tiles, allowing wire harness manufacturers to use the Panduit Automatic Cable Tie Installation Tool (PAT). The PAT System is six times faster than conventional cable tie installation systems, which can further improve productivity. 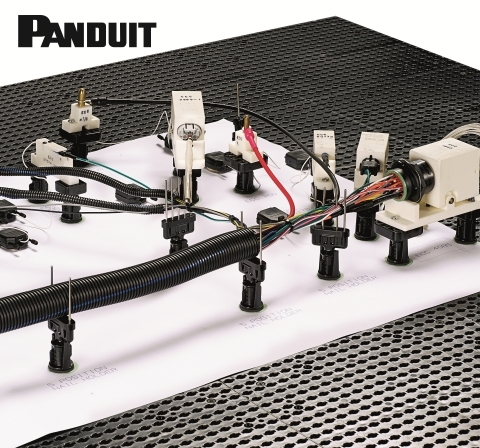 The Quick-Build™ Harness Board System by Panduit is a revolutionary, modular solution for wire harness manufacturers that greatly improve the productivity of wire harness assembly builds.